Is Fiverr A Legit Website, Or Scam Central? Last updated on April 4, 2019 By Nat Leave a Comment This post may contain affiliate links. We appreciate you supporting Rags To Niches! Full disclosure here. Is Fiverr legit, or a scam website?! Should you bother with them at all? Well, the Fiverr platform itself is completely legit, but there are plenty of scammers operating on there. This is what I’m going to help you out with today! Fiverr can also be a legitimate way for people to make money online, by selling their own products and services. So, this could be an opportunity for you too. During this post, I will discuss what gigs are worth purchasing – and which ones you should stay well clear of! Fiverr is a worldwide marketplace that offers a wide variety of “gigs” or services for just $5. Now, Fiverr has changed their rules so that you can additionally offer “gig extras,” and these gig extras will allow the seller to charge more for extras. In fact, I heard that a gig extra could be up to $10,000! So, there is certainly scope here to make some big money on Fiverr as a seller. Fiverr was founded by Shai Winiger and Micha Kaufman in 2009. It was actually launched in 2010 and by 2012, it had already had acquired over 1.3 million gigs! Fiverr’s gigs are sorted into categories and sub categories. I noted that one person had left a comment, complaining that the spell they’d purchased, had not worked!! And some of the bizarre gigs on offer are actually top sellers! So, if you think you have zero skills and zero to offer the Fiverr marketplace …it may be time to think again! I do urge you to try and get your own gig going, it’s very simple to set up and there are so many categories on there – literally anyone could figure out something to sell. Fiverr is ever growing in popularity, (and competition) day by day – but there is certainly a chance to jump on now. It’s better to get started soon, as the competition is continuously getting tougher as this platform grows. By quickly working hard to build up your following, customers and reviews – you can get ahead in the game while there is still space to do so. If you’re not keen on setting yourself up as a seller, Fiverr also has plenty of reasonable gigs that you can purchase – but this is where you need to be cautious. I’ve personally had some pretty terrible writing done on the down side, but have also had some great e-book covers created that I’ve been very happy with. I love the concept of Fiverr – but there are plenty of sellers out there dishing out utter junk, so you need to be careful. Some gigs can even harm your business! The company “Fiverr,” is completely legit and you certainly don’t have to worry about getting paid or sending money through their site. It’s the sellers you need to be cautious about…. So, below I’m going to outline some GOOD vs BAD gigs! Have you had a different experience? Let me know in the comments! Three Fiverr Gigs You Should Avoid! If you look to outsource some writing for your website or blog, the writing can be very poor quality and may not be unique. Checking the article via copyscape can show you if it’s a direct lifted article, but sometimes they change it just enough that it can pass this. Alternatively, the seller may be using an article spinning software, which will normally produce something horrendous and completely unreadable. I’ve only ever attempted to pay for a couple of articles on Fiverr and they were poor quality, I couldn’t use them. However, if you’re a decent writer yourself, this could be an opportunity for you to squash the competition and get your foot in the door freelance wise. If you’re even a half competent writer and don’t mind writing for a very small amount, (at first) you will have an advantage over others. You could progress later by offering a smaller amount of words for $5 and adding more words in your gig extras. They promise you a gazillion likes on Facebook? Any likes that you get will be from fake accounts and you will get zero engagement on your page. I’ve also had reports back from others who have purchased this service, (against the advice of many) only to find that while the likes came on very suddenly, they also gradually disappeared over time. Don’t be fooled by squeaky clean reviews either – many Fiverr sellers will sooner refund you than risk ANY negative feedback. So, if someone has a massive refund rate, you’d be none the wiser by looking at their sellers page. Additionally, most people also just don’t feel it’s worth their time to complain about a $5 gig. They get it, it’s rubbish and they definitely won’t buy from them again – but they can’t be bothered to leave a bad review, (especially if they’ve already had a refund). Now that sellers can offer additional gig extras, there may be more incentive for people leaving bad reviews. This is definitely a gig to run far away from. Many of these services are automated and will not provide you with any benefit whatsoever. In fact, it’s far more likely that they could greatly harm your business. Since google panda and penguin algorithm updates, blackhat backlinking techniques could seriously damage your rankings. your website could disappear without a trace from the SERPS altogether and you can wave “bye bye” to your traffic with it. How To Get The Most Out Of Fiverr.com! Do not give out your personal info. It’s a dream really, because you can try out all sorts of gigs without revealing who you are – unless you want to of course. Actually, it’s worth mentioning in contrast to this, that gigs with intro videos on the page do convert better. Although, you could always get someone else to do it, or outsource an animated video or whiteboard style video – from Fiverr itself! This may sound like a contradiction as I suggested freelance writing earlier. But in an ideal world, you don’t want to be doing gigs, (long term) that will take up vast amounts of your time. If you’re selling your time, you’ll have to work very hard to make any sort of reasonable living when you’re only getting $4 per gig. You want to create the most profit, for the least amount of your time. For example, by creating an automated system, an e-book, a course, a file, a pre-recorded video, results you can generate effortlessly from software. These are ideal things to sell on Fiverr, because you put in the effort once, (e.g. by writing that ebook) but get paid for it time after time. The only key effort is you still have to manually send all your gigs via Fiverr right now. But your long term goal should be to be making money more passively, with minimal effort. Then you still have time to focus on other streams of income! Make Extra Cash… Or More! After Fiverr take their cut, you will earn just $4 a gig. Obviously, this isn’t much and you’d need a whole bunch of gigs per day to make it worth your while. However, with the introduction of gig extras, this little $4 number can be raised over time. The issue I find is that people are now lowering and lowering what they will provide for the $5 – which has somewhat deflated the initial purpose of the site. More and more it seems you just get a “taste” of something for your $5, anything more besides and you will have to pay more. There are exceptions of course, but it’s just something I’ve noticed while browsing on there. As you grow as a seller, the opportunity to add extras means you can potentially make a lot of money. I did hear of someone having a 10k gig on Fiverr at some point… This has probably increased now! As a buyer, there are some gigs that seem to work well consistently and you can get good value from them. You know how people have fancy video introductions on their you tube videos? Yep, plenty of them purchased these on Fiverr and some of them look really good! To get something really nice and professional, you may need to pay for a gig extra or two, but this will be worth the investment. Animated videos have been shown to have higher conversion rates than regular videos – so, it’s no wonder that they’re suddenly everywhere now. While there is a risk of whiteboard overload, I’m still enjoying them right now. Infographics are so popular now, but creating them yourself can be time consuming and confusing if you don’t know how to do it. I’ve tried a couple myself and they didn’t really have the wow factor I’d been hoping for. Infographics are also the perfect thing to pin on Pinterest – so, if you’re getting on board with Pinterest marketing, it’s a good way to reach more people, plus generate natural backlinks to your website. Obviously, you need to be careful here to get a reasonable editor, so ideally go with someone who is a best seller – give it a go and see how it goes. When you’re writing a lot of content on your site day in and out, it can be a good idea for someone to take a look over it for you. I generally don’t do this and every single time I read back on an old post, I see errors that need correcting. Editing will become particularly important if you’re writing for clients, or if you’re creating ebooks and self-publishing. I think a majority of podcasts I’ve been listening to, get their voice over intros on Fiverr. You need someone with a really great distinctive, (maybe slightly cheesy) voice to give it the right feel :). Having a voice over intro just add a more professional feel, no matter what the purpose. It could be for a podcast, an Ad, maybe the voice over for a new product you’ve created. I’ve used an Ebook cover service myself and have been really impressed by the result. If you have any design skills, this is also a popular area that you could get into. 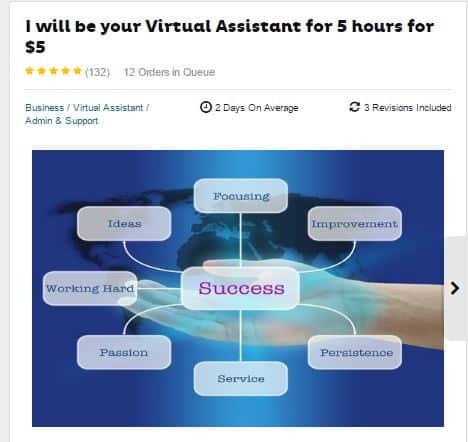 If you’re looking for a Virtual Assistant, Fiverr could be a good place to source one on a budget. A good thing about this is, if you have a rough amount of work in mind and a set amount of hours, you will be able to try people out and see how well they do in that time scale. If you figure a few jobs will take a few hours and they do it in two – great. But if they haven’t even completed a quarter of the work you’d hoped, you can always try someone else and at least you haven’t spent very much money. When you think about it, I bet there are a whole host of tasks that really don’t need to be done by you personally! Think about freeing up a bit of time, so you can work on the parts of your business that really count. So, those are my top 7 gigs to try out on Fiverr – Do you have any more you think I should add to the list? In Conclusion: Is Fiverr A Legit Website? YEP! 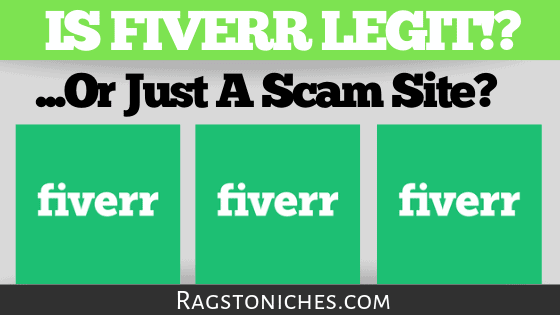 Fiverr is not a scam. Just be cautious what you’re doing and be aware that there are some people on there just looking to make quick money and not providing value. There are definitely scammers operating on there, but at least you can trial these things out at a budget price. Ultimately, there are some really great gigs that will save you a lot of time and money. What gig do you think you’d find most useful on Fiverr? Want To Build An Online Business?! If you’re unsure about Fiverr, but are interested in building a business online – there are lots of options! One way to get started is to think about having your own website. This is something you can build over time and an asset that can grow in value. If you’re not sure how to earn money from a website or blog, it’s not as complicated as you may imagine – but it does take time and work. The best way to do it is simply to learn, step-by-step. If you want to learn more, this free training will help! I hope you found this post useful. If you have any questions at all, please let me know in the comments!